The reviewed Ford GT No. 66, the 2017 24 Hours of Daytona winner, is spectacular, but lists at just $44.99. Compare that with a lot of other brands that are pushing the $80 to $100 price range. To mark the 50th Anniversary of the original Ford GT’s win at Le Mans in 1966, the blue oval folks reinvented the racer for sports car endurance racing in 2016. It won at Le Mans in its class that year, and also at Daytona’s endurance classic in 2017. Sebastian Bourdais, Joey Hand, Dirk Mueller drove the GT to fifth overall at the Rolex 24 at Daytona, seven laps behind the winning prototype racer, but won the Le Mans GT class. They edged out a Porsche 911 by an eyelash less than three seconds. 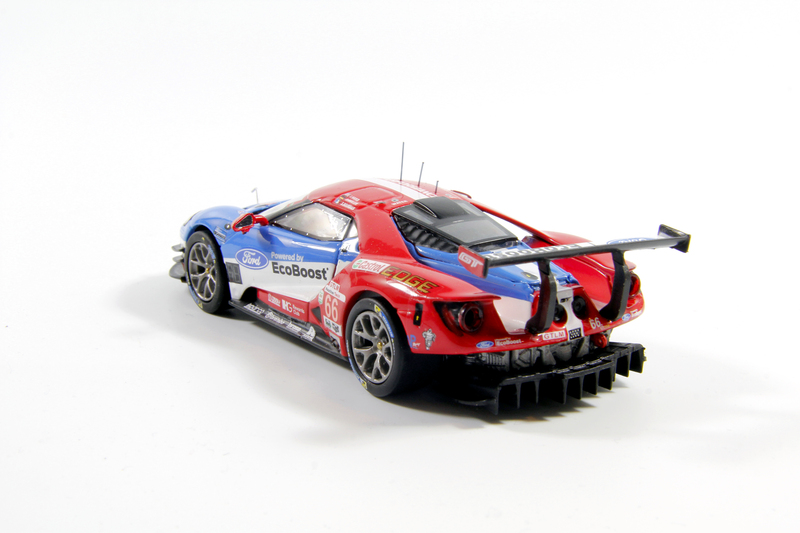 The next best Ford GT finish was ninth overall. The racer, which is quite similar to the street car version, touts the same 3.5-liter twin-turbo EcoBoost V6 that makes 500 horsepower. Roush Yates engines develops and builds the engines for Ford Chip Ganassi Racing, which races the GTs. Ironically, the street version GT actually is closer to 600 horses, but road and race rules are decidedly different. Don’t ask! First, the body is beautifully sculpted, as in the original 1:1 car. Proportions are perfect and the body detailing is precise. The tunnels between the flying B-pillars look great and the giant red rearview mirrors look sharp too. Front lights detail the three-bank high-intensity lights of the racer, with the smoked covering lens. In back are the round rocket-booster lights that make a GT look so special as it races away from the competition. Detailing and decaling look great. There’s a red tow-hook front and rear, the flat black chin spoiler and grille at the nose, plus two black winglets on each side of the nose. In back is a giant finned black diffuser under the engine, plus a delicate looking rear wing touting the Ford blue oval and “Powered by EcoBoost” is a winner. Decals from the black on white Ford banner across the windshield’s top to the numbers and sponsor logos along the sides are spot-on. The cockpit’s tinted windows give the car a racier look than would completely clear ones, although that makes viewing the interior more difficult. I like the side windows that show off the silver rivets that hold them in place though. Peer through that smoky rear deck’s window and you’ll see the top of the GT’s EcoBoost V6 You won’t see much else through any windows though, except the dash and steering wheel. Oh, and a bit of the roll cage is visible inside the A-pillars. Below the body’s rear shell is a stamped flat gray plastic piece depicting engine and suspension components. Also, atop the roof are three black radio antennae. Smoked racing wheels tout properly branded Michelin racing slicks and you can see giant brake rotors behind the wheels Plus each side has small twin exhausts, and a decal representing the digital readouts that indicate the car’s position to race fans as the cars circle the track. Too bad this one isn’t “lit up” to P1. 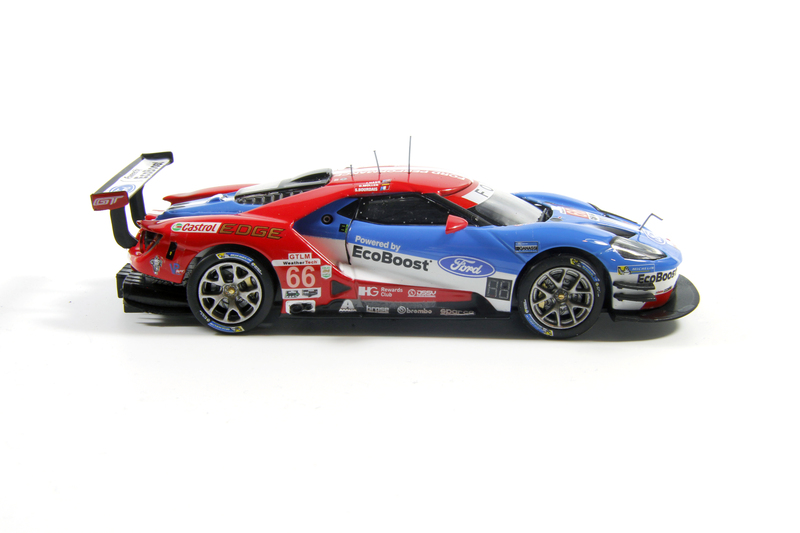 Yet for the price you’ll find no better 1/43 Ford GT for your collection and Ixo’s lineup is available from Replicarz, the Vermont-based die-cast retailer.